Increasing your chapter’s membership helps Pi Gamma Mu accomplish its mission to encourage and recognize superior scholarship by extending the benefits of membership to more students. It is the collection of the lifetime membership fees from new members that sustains Pi Gamma Mu and we ask for your continued support in this area. Increasing membership will also benefit more of the high performing students at your school with opportunities for scholarships, publications, networking, and more. 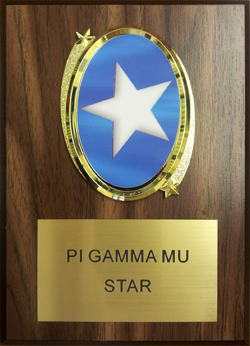 Increase your chapter’s number of new initiates by 20% or more as compared to the previous academic year and we will send you a Pi Gamma Mu Star plaque and will recognize your chapter in a future issue of the Pi Gamma Mu newsletter and website. Georgia Mu, Emmanuel College, Robert J. Fulton, Jr.
*Missouri Delta, Lindenwood University, Donald Heidenreich, Jr.
Texas Omicron, West Texas A & M University, John David Rauch, Jr.
*Chapters have obtained Star status two times. **Chapters have obtained Star status three times. Note: The Star Chapter program was started in 2014-15. Missouri Delta, Lindenwood University, Donald Heidenreich, Jr.